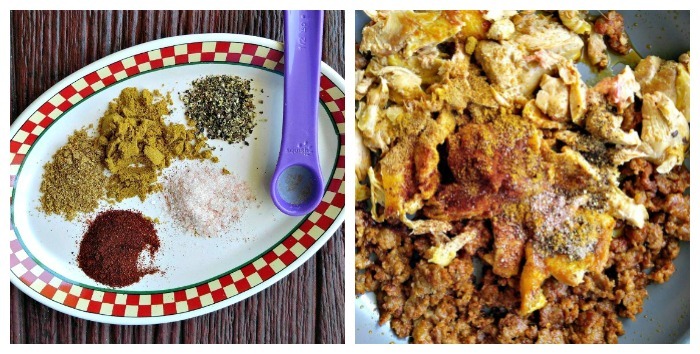 It’s time for one of my favorite international dishes – Mexican Chori Pollo. This recipe is full of bold flavors, topped with cheese and baked in the oven for one amazing meal. If you eat at Mexican restaurants often, you will likely have seen Chori Pollo offered as a choice. 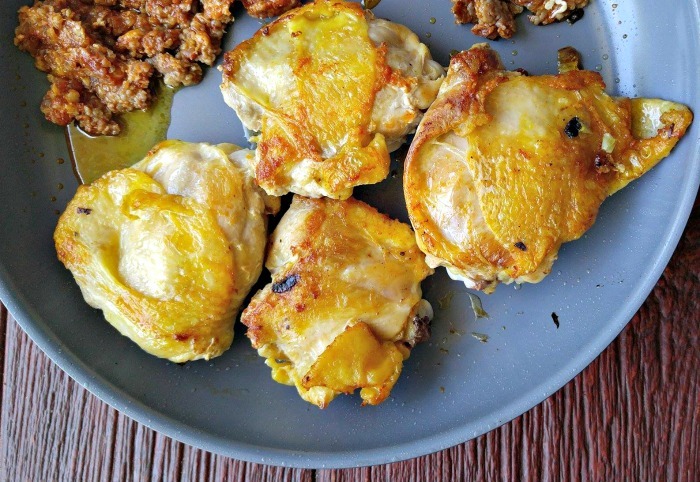 The dish is similar to pollo ala crema but is more savory and less creamy. The dish is made with cooked chicken, Chorizo sausage, and shredded cheese. It is normally served over rice,but I decided to use cauliflower rice, seasoned with Mexican spices, as my base today. 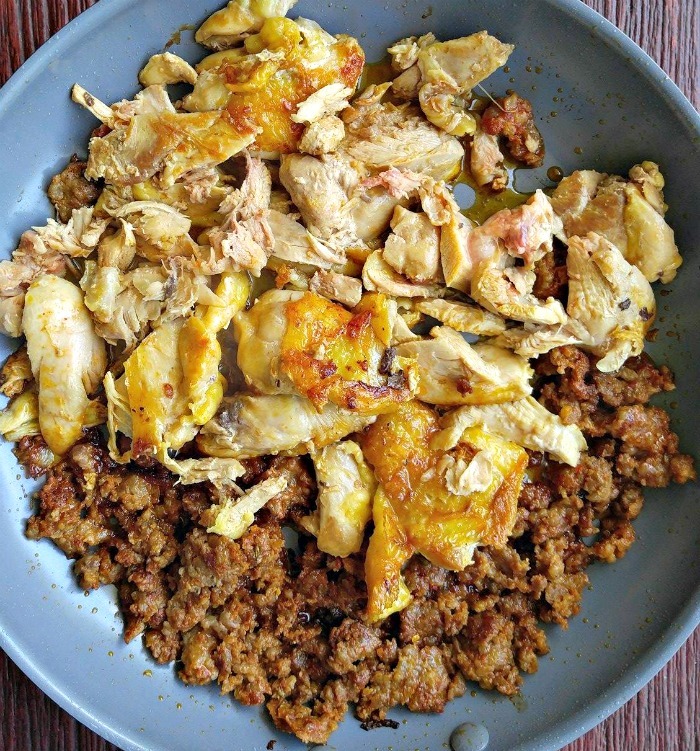 Making this gluten free Mexican Chori Pollo Recipe. The key to the flavor in this dish is the layers of ingredients. I start by caramelizing my onions in clarified butter. Clarifying butter leaves the flavor but removes the milk solids so it gives the butter a higher smoke point and makes it perfect for cooking the onions beautifully. It also helps to lower the amount of dairy in the meal. I used chicken thighs for the recipe. The dark meat adds a richness to the dish that gives it a lot of bold flavor, and I’m keeping the cheese down to save on calories so I want the extra richness. After the chicken starts to brown, remove the chorizo sausage from the casings and add it to the pan. Cook until the chicken is no longer pink and the sausage is cooked, breaking the sausage up as you go. The dish cooks more quickly if you remove the chicken from the bones at this stage. Extra flavor comes from a nice blend of Mexican spices: I used ground coriander, smokey cumin, garlic powder and chili powder as well as sea salt and cracked black pepper. Add the spices to the cooked chicken and chorizo and combine well to incorporate them throughout the dish. The last step is to place the chicken pieces in an oven proof baking dish. 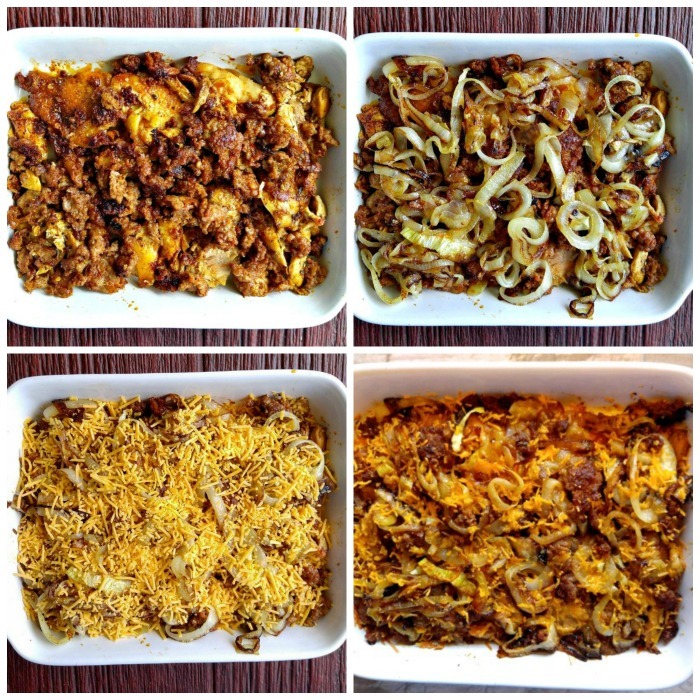 Top with the cooked chorizo, caramelized onions and shredded cheese and bake for about 10 minutes until the cheese melts. Instead of cooking rice, I pulsed cauliflower in a food processor and cooked it on the stove top while the chori pollo was baking. This keeps the dish gluten free and low carb. Some more of the spice mix gets added to the “seasoned Mexican rice” and it’s ready when the Mexican Chori Pollo comes out of the oven. 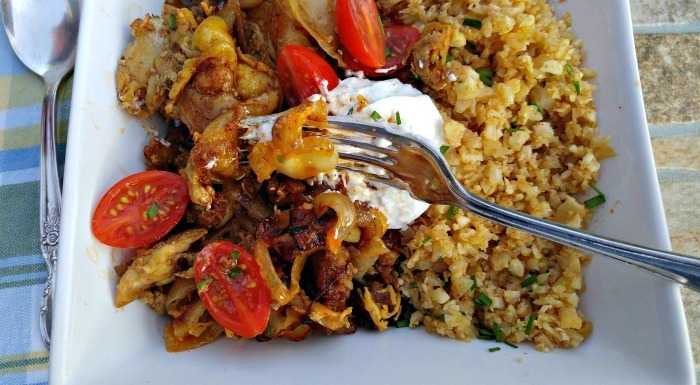 Top with some sliced cherry tomatoes and sour cream and you have one amazing low carb and gluten free Mexican dish. 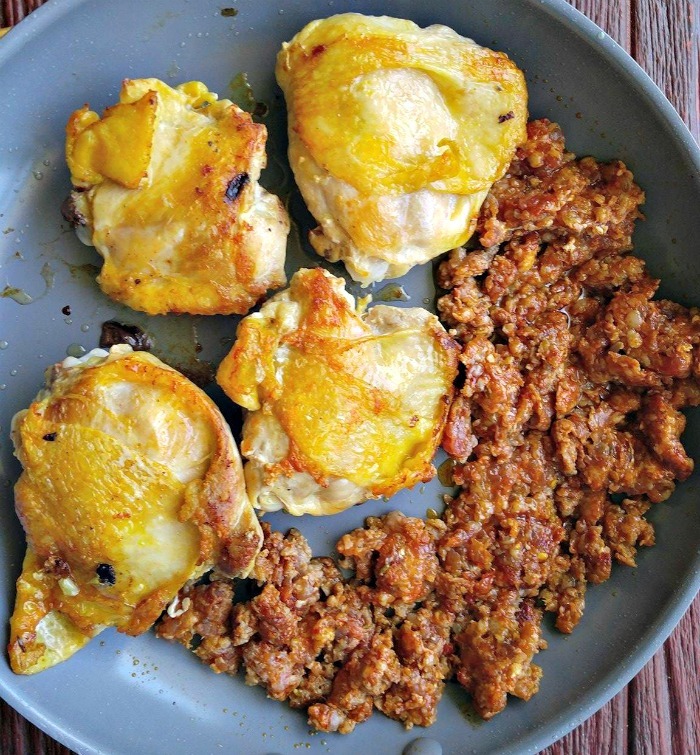 This chori pollo recipe is rich and creamy with big bold flavors that come from the spices and chorizo sausage. It has a sweetness from the caramelized onions and makes a great choice for those days when you feel the yen for a bit of heat on your plate! It’s ready in about 45 minutes but you can turn it into a 30 minute meal by using cooked rotisserie chicken. It's time for one of my favorite international dishes - Mexican Chori Pollo. This recipe is full of bold flavors, topped with cheese and baked in the oven for one amazing meal. 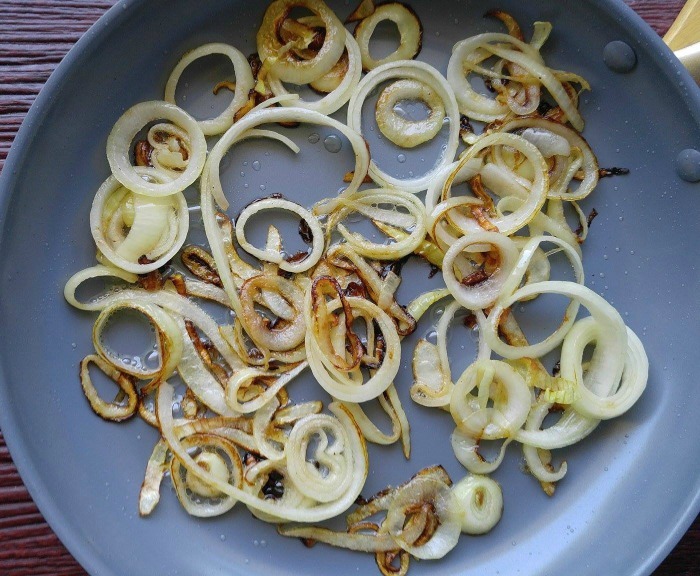 Melt the butter in a non stick pan and add your sliced onions. Season with sea salt and cracked black pepper and cook over medium heat for 7 - 10 minutes or until the onions are golden and caramelized. Remove the chorizo from the sausage casings. Add the chicken pieces and cook until the chicken about 5 minutes. Stir in the chorizo sausage meat and continue cooking, breaking up the sausage meat, until the chicken is no longer pink and the sausages are cooked, about 5 minutes longer. Remove the chicken from the bones. Stir in the coriander, cumin, garlic powder, and chili powder. Season with additional salt and pepper if desired. Heat for 3 - 5 minutes. Place the chicken pieces in an oven proof casserole dish. Sprinkle the chorizo evenly over the top of the chicken. Then spread the caramelized onions over the chorizo. 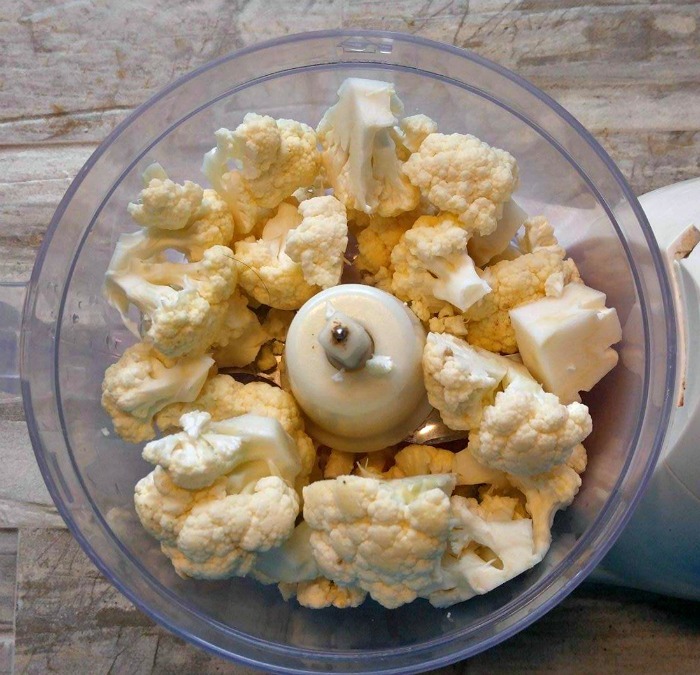 While the cheese is melting, cook some pulsed cauliflower in about 1/2 cup of chicken brown and 1/2 tsp each of the spices that you used in the casserole. 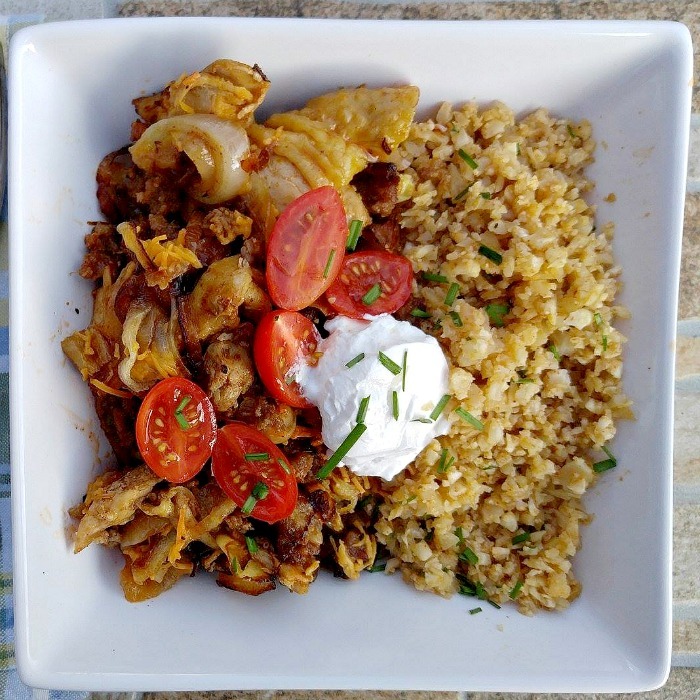 Serve the chori pollo hot over cauliflower rice mixed with Mexican flavorings and garnish with sour cream, sliced tomatoes, chopped chives or whatever other Mexican toppings you enjoy. How much corizo does the recipe call for? You left it out of the ingredient list. You can use rice and still be gluten free. But the cauliflower is probably better if you want to cut carbs.